Tricksta drops his fifth mixtape of the month on #EstateLife and what a killer mix it is showcasing talent from all corners of the UK. #EstateLife is going for gold this year with 11 volumes since January 12th. 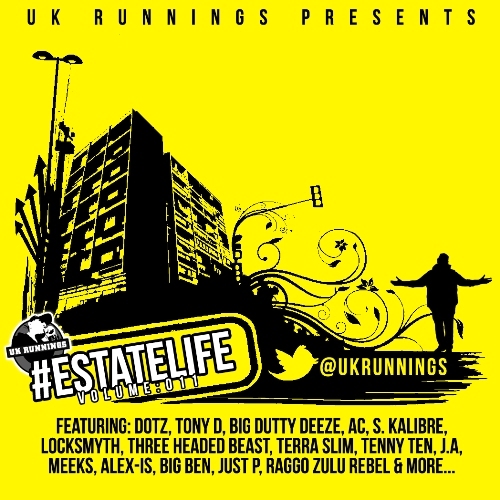 With T-Shirts, Hoodies, Beenies & Sweatshirts already out and selling everybody is talking about UK Runnings, a mixtape series that plans to drop 100 mixtapes in 2014. 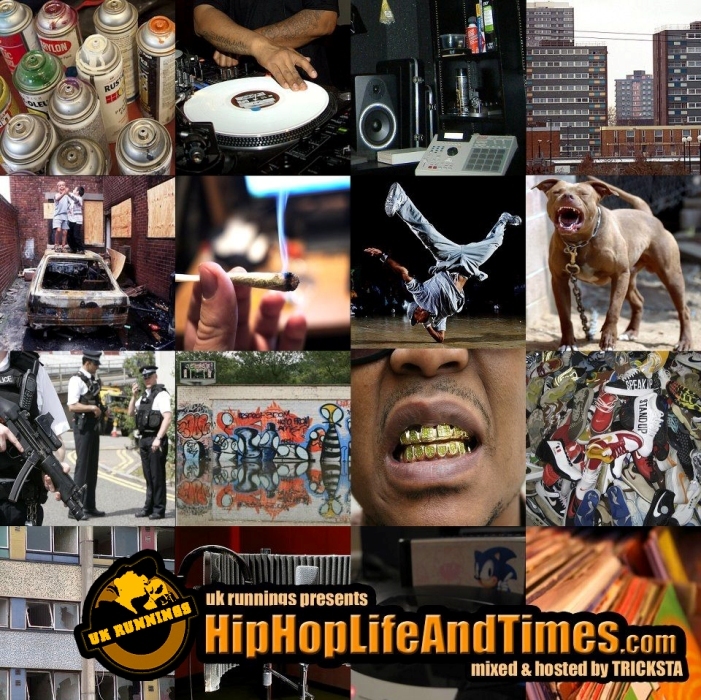 Volume 011 features Tricksta, TBear, Twissman, Tenny, Dotz, Alex-is, Nature The Kidd, Raggo Zulu Rebel, S.Kalibre, Locksmyth & Tony D, Big Ben, Supar Novar, Terra Slim, Big Dutty Deeze, Three Headed Beast, Zo, Seti aka K9, Big Si, Sir Mic, Bless, Scarz, Jey Palm, J.A (Soul Rhymaz), AC, Just P, Broken Poetz, 3D, Dirtz, Meeks and M3. A Hip Hop night finally returns to my town of Bognor Regis and what a sick night it will be too, Celebrating 30 years of Hip Hop in Bognor Regis in the name of Lee ‘Tiny Cee’ Chapman who sadly passed away in 2010. 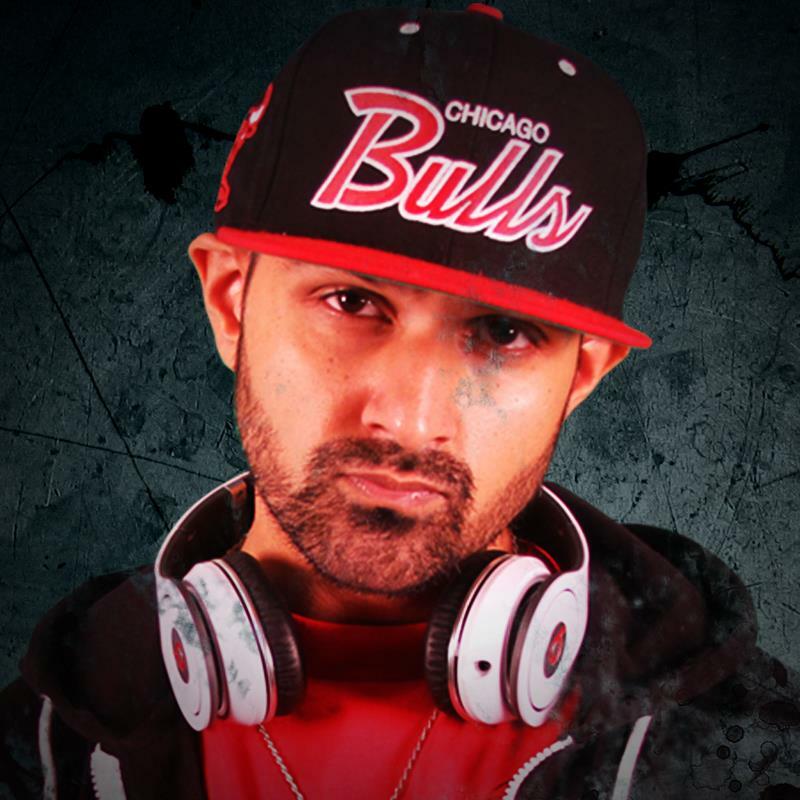 Lee was a founding member of Severe Carnage, a Hip Hop crew from here in Bognor Regis on the South Coast of England. Formed in the late ’80s the line up consisted of rappers Tiny Cee, MC Pryme and A.K.A. with producer/DJs Scape One and Mack One (Macca, now know as Mac McRaw, Wildstyle Bob, Nimble, Beathoven from Puma Strut fame). The line up changed sporadically over the years with other members including DJ Trooper One, DJ Shelly Mack (Knowledge of Self) and Millzee. They released only one record, the extremely rare and in demand ‘The Struggle Continues’ on white label demo (which im proud to say I still have a copy of!). 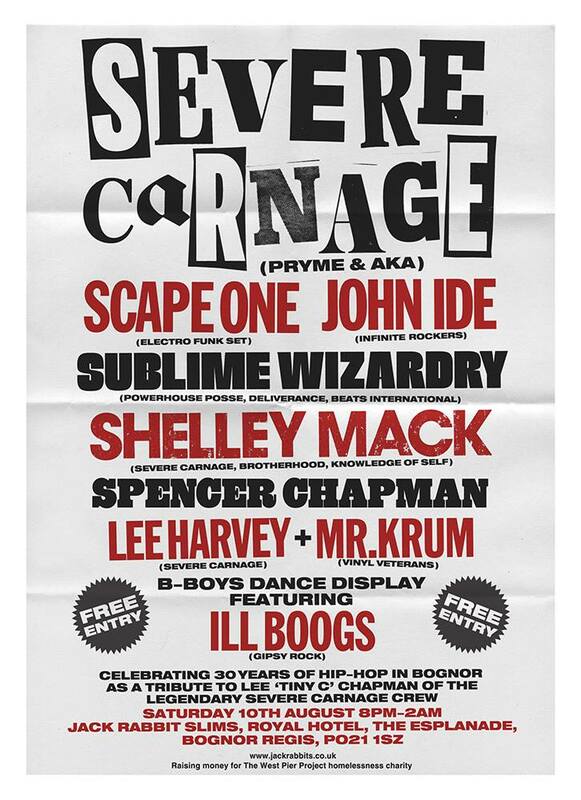 The night will see the old Severe Carnage crew reunite Featuring live performances by Severe Carnage’s MC Pryme & AKA, Sublime Wizardry, with DJs Scape 1 (Old school electro funk set), John Ide, Spencer Chapman, Lee Harvey, Shelley Mack & Mr Krum plus bboy dance display feat. Ill Boogs. The event is free entry and the organisers will be collecting for The West Pier Project homelessness charity. SEE YOU THERE!!! And here’s a piece of very rare south coast UK Hip Hop history for you… Very old material of Severe Carnage and Scape One jam sessions from 1988 to 1991. The tracks have been cleaned up as best as possible. The quality can vary due to the source material from old cassette tapes but the nostalgia is unbeatable. Grab a copy while you can. Now complete with the recent rare and sought after ‘The Hunt’ now available for the first time. Yes!! It’s finally here! Our first official mixtape hosted and mixed by our homie Tricksta. This has been a labour of love for the last year, but it’s finally dropped for your little ears to be blessed by. It’s volume 1 because don’t even think this will be our last mixtape, this is the just the beginning. It features some of the biggest heads from the UK scene: Big Cakes, Too Many T’s, QELD, The Locksmiths, Raggo Zulu Rebel, Cyclonious, Iron Braydz Ruthless, LATE, Ramson Badbonez, Sonnyjim, Big Dutty Deeze, Supar Novar, B-iLLA, Genesis Elijah, Danny Bones, Terra Slim and many more. We’re so stoked for this, and can’t thank the artists enough for contributing to this, and if you wanted in then don’t worry they’ll be others, you best believe. 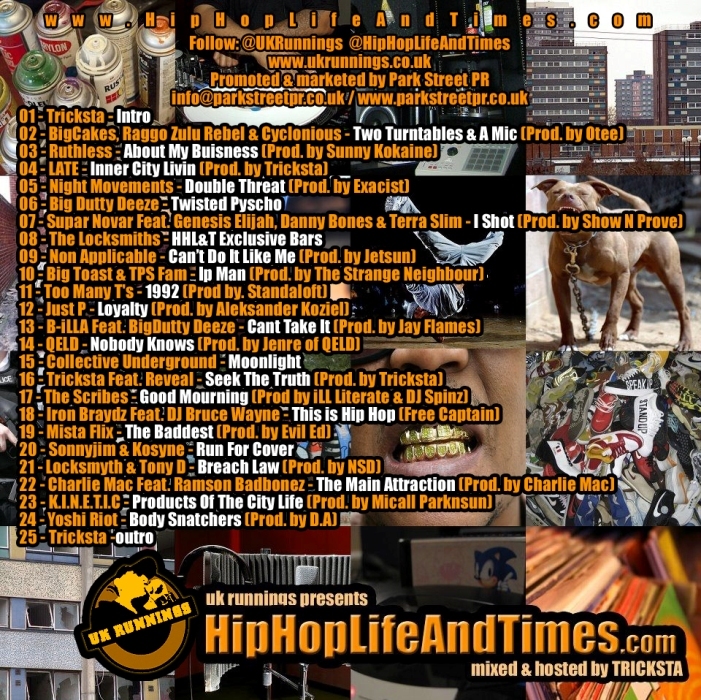 Special Shout outs to Tricksta at UK Runnings/ParkStreet PR, Big Dutty Deeze not only for his killer verses on the mixtape, but also for his work on the front and back cover artwork, all the dudes on this mixtape, and of course all of you that have supported us over the last year and half. If ever want to be on the site, take a listen to this and learn a few lessons on what good hip-hop sounds like.